To keep the bushing, housing dean before installing. The outside surface be covered a little grease or oil during installing, which help the process. And please not too much. The bushing should be pushed into housing slowly with mandrel (oil push machine is recommended), it is for hidden to hammer the part directly. We need your instructions if the housing wall is thin or made from soft metal in order not to destroy it. Zn order to simply the installment and keep the working layer, we recommend that the shaft should own chamfer and HRC45/RZZ-3. Gr plating layer is allowed. Grease and Oil are recommended in order to shorten the mending. OD, checked by ring gauge with GO/NO GO. ID, checked by plug gauge with GO/NO GO. 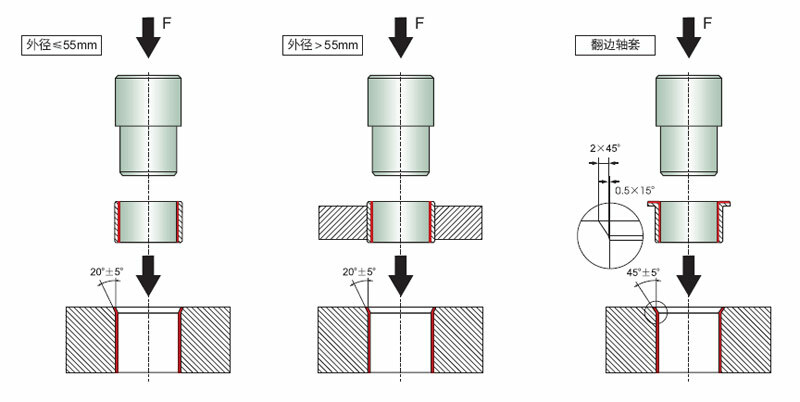 The common wrapped bushing satisfy tolerance H9. The size of ring gauge & plug gauge are in comply with DIN1494 part 1.